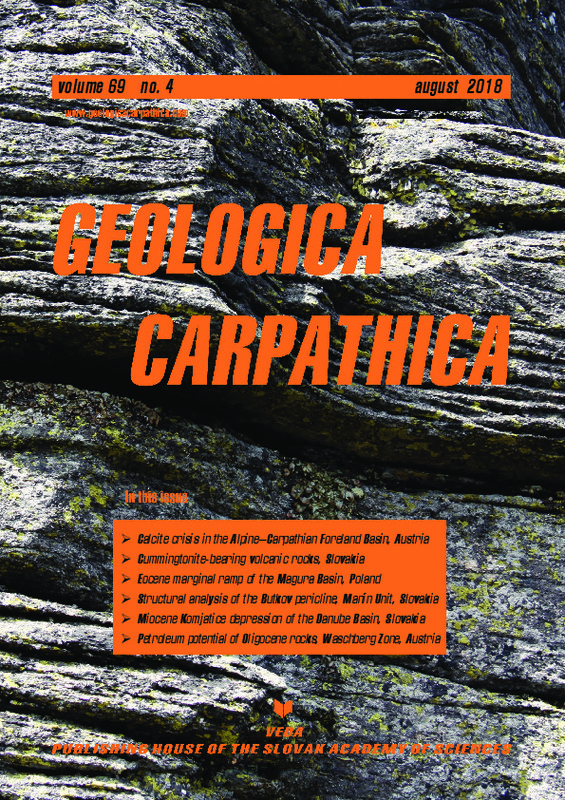 Abstract: Oligocene successions in the North Alpine Foreland Basin (NAFB) and the Western Carpathians reflect Paratethys-wide paleogeographic changes, which also control their petroleum potential. Whereas these rocks have been studied in detail in both areas, the transition zone is still under-researched. In order to fill this gap, the Oligocene succession in the Waschberg Zone, comprising the Ottenthal Formation (NP21–23) and the overlying Thomasl Formation (NP23–24) has been studied using outcrop (Waldweg section) and borehole samples (Thomasl, Poysdorf) and a multi­disciplinary approach. The Ottenthal Formation is subdivided from base to top into marls and shales (Ottenthal Mbr. ), diatomaceous shales (Galgenberg Mbr.) and marlstones (Dynow Mbr.). Biogenic silica contents, determined using atomic absorption spectroscopy, reach 30 wt. % in the carbonate-free Galgenberg Member, but also in the Dynow Members, which is characterized by upward decreasing productivity of calcareous nannoplankton. Close lithological relations exist with the Oligocene succession in the NAFB, but diatoms are largely missing in the latter. Organic matter contents are surprisingly low in the Ottenthal and Thomasl formations in the Waldweg section, which therefore are poor hydrocarbon source rocks. In contrast, the Thomasl Formation, encountered in the Thomasl and Poysdorf boreholes, holds a fair to good hydrocarbon potential (~ 2.2–2.5 wt. % TOC; type III and type II kerogen) and may generate 1.0 to 1.6 tons of hydrocarbons/m². Obviously TOC contents of borehole samples are significantly higher than in outcrop samples. Because of severe indications of weathering (e.g., presence of gypsum and jarosite), a detrimental effect of weathering on the samples from the Waldweg section cannot be excluded. Biomarker data suggest a nearshore depositional environment with changing oxygen-availability and salinity. Vitrinite reflectance measurements show that the investigated sections are thermally immature.